Is high-rise public housing doomed to demolition? A book and article by historian Nicholas Dagen Bloom, focusing on experiences in New York City, show that selecting tenants – and, in the process, discriminating against the most vulnerable candidates – is a key condition for the long-term success of social housing. For the last two decades, American cities have been knocking down high-rise public housing developments and replacing them with “Section 8” programmes, which provide direct aid to the poorest in the form of vouchers for private-sector rental (Wyly and DeFilippis 2010). The fact is that America’s social-housing towers – “the projects” – have a disastrous reputation. They concentrate poverty, which serves only to attract and exacerbate other problems; they have become the visible symbol in the cityscape of urban decline and of what not to do in terms of urban planning, even though they represent only a small proportion of all social housing, and even though social housing makes up only a small part of all housing for poor people  (Wyly and DeFilippis 2010). And yet New York’s tower blocks haven’t been demolished, unlike the infamous Pruitt–Igoe projects in St Louis, Missouri, or the Robert Taylor Homes in Chicago (Venkatesh 2002). Today, over 10% of all social housing in the US is managed by NYCHA (the New York City Housing Authority), despite the fact that New York is home to only 3.2% of America’s urban population. Social housing accounts for 5.8% of the city’s total housing stock. This proportion is low compared to Western Europe: in Paris, 17.1% of all dwellings are social housing, while in Amsterdam the figure stands at 52%. Data: Wikipedia, Bloom (2012) and Furman Center for Real Estate & Urban Policy (New York University). To explain this New York-specific exceptionalism, three types of factors can be identified. First, New York is a city unlike any other in the United States: it is both highly populated and very dense, with a constant inward flow of immigrants (and young people) and a relatively extensive and efficient public transport system. There is always demand for the apartments in NYCHA’s high-rise buildings, even those with the worst reputations, and these towers are almost always fairly well served by public transport, enabling adults to get to work easily. Second, NYCHA is a shrewd social landlord. NYCHA has always tried, often successfully, to eliminate candidate households that would be unable to pay their rent. What this means in practice is that NYCHA has tended to give priority to people in employment, to the detriment of the poorest and most vulnerable households, who find themselves relegated or at the mercy of slumlords in poor neighbourhoods who take advantage of the inward flow of migrants and the economic dynamism of the city. As the Democratic senator Robert F. Wagner remarked in 1937, what NYCHA provides is, after all, an offer of a lease, not a gift. NYCHA has always strived to maintain its buildings as well as possible; and its directors have often managed to assert their views in conflicts between municipal administrations and with regard to the distribution of the meagre federal funds available. Third, the fact that NYCHA has been a major player in the field of social housing for so long has had an irreversible “ratchet” effect: it would be impossible to rehouse 400,000 people without causing a major crisis, and it is impossible to demolish buildings that are full of tenants; furthermore, tenants’ associations keep a close eye on what goes on (Bloom 2009,2012). How did the current situation come about? Between 1900 and 1930, the population of New York City doubled, from 3.4 million to 6.9 million. This growth benefited the slumlords. There was absolutely no question of building social housing, partly because property developers were against the idea and partly because it would have been prohibitively expensive for the city council to take on this task. The Great Depression of the 1930s brought with it a different context, however: vacancy rates rose, and the collapse of the real-estate market provided opportunities for reformers (Pouzoulet 2006). New York City Council started to build social housing in 1934. In 1937, Roosevelt’s Housing Act was passed by Congress, enabling the funding of ambitious programmes. Property developers, urban reformers and Robert Moses (the “power broker” in Robert A. Caro’s 1974 work of the same name) all agreed with the principle of “aggressively” cornering federal funds to meet the needs of the working classes (Wyly and DeFilippis 2010). For some, the key aim was to build housing similar to that provided by the market and disperse it across the city, to avoid stigmatisation and concentration. For others (such as Moses), social housing above all had to meet functional needs; building large towers to replace slums cost less (Pouzoulet 2006). For Moses, the projects were a means to an end, namely achieving urban renewal, and providing workers (and not the “underclass”) with functional dwellings with modern comforts that were superior to the alternative available on the open market. 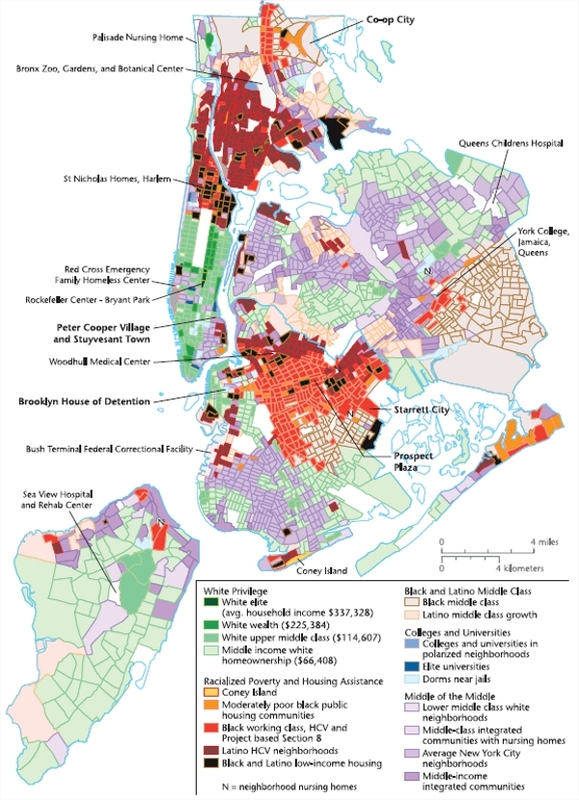 Up until the mid-1950s, social housing was inhabited by white households, who still represented 42.7% of NYCHA tenants in 1962. This figure had dropped to 27.9% by 1969, and today stands at 4% (Bloom 2012, p. 422). Between 1941 and the late 1960s, over 5 million African Americans fled the South to work in industry in the cities of the North-East and California. This Second Great Migration occurred at the same time as growing suburbanisation: white households took advantage of federal incentives to buy houses in middle-class residential areas on the edges of cities. The combination of these processes led to white flight to the suburbs: following the arrival of black populations in inner-city areas, white people began to fear that property prices would fall, that standards in local schools would drop and that crime would increase. At the same time, residential suburbs were becoming more accessible, both in financial terms and in terms of transport. The resultant racial transformation of New York’s social housing had consequences in terms of the locations of high-rise developments: the segregationist white elites, and those that voted for them, preferred to concentrate projects in the ghettos (Pritchett 2002), where, “moreover”, land was cheaper. This resulted in a geography of social housing that reinforced segregation. In the early 1960s, NYCHA encountered two types of problems. On the one hand, property developers were furious to see a public operator not losing money, and accused it of distorting the market. Under pressure, NYCHA sold eight towers (containing 7,287 apartments) to the private sector that were certainly among its most profitable. On the other hand, African American and Puerto Rican activists, along with some academics (including Frances Fox Piven, the author of Regulating the Poor), criticised NYCHA’s excessively strict criteria for selecting tenants. The proportion of tenants on welfare rose from 11.7% in 1962 to 34% in 1973; in 1972, half of all new NYCHA tenants were receiving welfare benefits (Bloom 2012, p. 422). The proportion of welfare recipients in certain projects exceeded 40%, although none reached the levels seen in Chicago’s social housing, where over 70% of tenants were on welfare, leading to the kinds of problems that result from such concentrations of poverty (Bloom 2012, p. 422; Wyly and DeFilippis 2010). A similar pattern can be observed with regard to NYCHA’s expulsion policy: up until the 1960s, antisocial tenants were expelled; however, under pressure from activists, this practice was discontinued, reducing the options available to NYCHA to deal with difficult situations. These transformations, combined with New York’s fiscal crisis in the 1970s and rising crime levels, caused NYCHA to significantly slow down the rate at which they built and acquired housing. Between 1976 and 2012, the number of apartments leased increased by “only” 8.4%. NYCHA continued to sell some of its buildings and buy others, but these were relatively low-key and small-scale operations. Since the 1990s, NYCHA has once again begun to apply more rigorous criteria in selecting its tenants. Today, it manages some 2,600 buildings in total – including 69 towers of at least 1,000 apartments each – spread across 345 different complexes. NYCHA’s 180,000 apartments are home to just over 400,000 inhabitants, and on average cost $434 a month to rent. To put this into perspective, a two-bedroom apartment in Bushwick, a poor Latino-American neighbourhood in Brooklyn, costs between $1,500 and $2,200 per month to rent. Of NYCHA’s tenants, 46% are African American and 44% are Latino American. These households are poor: their average annual income is $23,000, which is on the poverty line for a couple with two children. But “only” 11% of tenants are on welfare, 47% of households have at least one person in employment, and the rest live on disability, old-age or war veterans’ pensions. The vacancy rate is 0.6%, with a waiting list of some 160,000 people. NYCHA prefers to have apartments that are not too big, to avoid concentrations of large families (often sources of disruption), and the internal layout of apartments is designed to ensure privacy, so that they remain attractive for working households. In order to select its tenants, collect rent and maintain its housing stock, NYCHA has a staff of over 11,000. To avoid any possible accusations of clientelism or nepotism, it recruits its employees by competitive examination. Of these, 22% live in social housing themselves. These employees have, “for over 75 years, systematically cleaned up after tenants, fixed broken windows, taken out garbage, cleared away snow, mowed lawns, washed corridors and carried out repairs in apartments” (Bloom 2012, p. 424). The work of NYCHA employees covers two key tasks: collecting rent and maintaining buildings. Despite the low incomes of its tenants, NYCHA managed to collect 98.7% of all rent due in 2011 (Bloom 2012). To achieve this, NYCHA relies both on its staff, who go knocking on the doors of tenants who are late with their rent, and on the threat of expulsion. The maintenance of its buildings is a strategic priority, in spite of limited funds. Since the 1990s, NYCHA has managed to obtain $6 billion in total from the federal government for maintenance operations. In 2011, NYCHA took, on average, 29 days to respond to non-urgent requests from tenants and 18.3 hours for urgent requests (Bloom 2012). In 2013, despite a deficit of $200 million, in part due to the sequester, the number of delayed repairs dropped from 420,000 on 1 January to under 190,000 on 1 September. The standardisation of NYCHA’s buildings has made it possible to reduce repair costs: they all have the same lifts, the same bricks, the same windows and the same roofs to be repaired and replaced. In short, the buildings may not be pretty, but they remain pretty solid and functional overall. One final factor that has contributed to the stability of NYCHA’s projects is a police presence. Between 1952 and 1995, a police force managed by NYCHA provided an original form of community policing, described by the historian Fritz Umbach in his work titled The Last Neighborhoods Cops (Umbach 2011). Initially, the officers of the NYCHAPD (New York City Housing Authority Police Department) were recruited among tenants or from the local neighbourhood, and their stated mission was to prevent problems while avoiding the use of coercion. There were as many as 1,500 officers patrolling the streets of social-housing neighbourhoods and in the corridors of high-rises (Bloom 2012). Like Bloom, and like Wyly and DeFilippis, Umbach noted that the application of less rigorous tenant-selection criteria in the 1960s profoundly upset the equilibrium of the projects and hastened the social-housing crisis. In 1995, Rudolph Giuliani dissolved this unique police force and merged it into the NYPD, at the same time as the New York City Transit Police. Since then, officers posted to police service areas in the vicinity of public-housing developments have exercised more conventional forms of law enforcement, based on the analysis of crime statistics (CompStat). Bloom’s work comes to a somewhat controversial conclusion: that well-managed social housing is social housing that eliminates the most vulnerable candidates. For Sharon Zukin, the author of a strongly critical review of Bloom’s book in Contemporary Sociology (Zukin 2009), the aim of social housing is precisely to enable the poorest in society to access decent housing: would it be better if they were on the street? Bloom can sometimes give the impression of caring more about the well-being of the elites than of residents – for instance, when he asserts that, thanks to social housing, “New Yorkers benefit from the low-paid work undertaken by NYCHA residents” (Bloom 2012, p. 429). In an American context marked by extremely hostile and prejudiced attitudes to the projects, it is perhaps necessary to put forward arguments that chime with the elites’ best interests. Bloom believes it is better to have selective social housing than demolished social housing, and his work is a useful starting point for debate and discussion. Ultimately, the history of public housing in New York provides food for thought on the operation, necessary conditions and function of social housing in our contemporary societies. Bloom, Nicholas Dagen. 2012. “Learning From New York. America’s Alternative High-Rise Public Housing Model”, Journal of the American Planning Association, vol. 78, no. 4, pp. 418–431. Bloom, Nicholas Dagen. 2009. Public Housing that Worked: New York in the Twentieth Century, Philadelphia: University of Pennsylvania Press. Buckley, Robert M. and Schwartz, Alex F. 2011. “Housing Policy in the U.S.: The Evolving Sub-National Role”, International Affairs Working Paper, New York: The New School, June. Caro, Robert A. 1974. The Power Broker: Robert Moses and the Fall of New York, New York: Knopf. Pouzoulet, Catherine. 2006. “La question du logement social à New York”, Transatlantica [online], no. 1|2006, 6 April. Pritchett, Wendell. 2002. Brownsville, Brooklyn. Blacks, Jews and the Changing Face of the Ghetto, Chicago: Chicago University Press. Umbach, Fritz. 2011. The Last Neighborhood Cops: The Rise and Fall of Community Policing in New York Public Housing, New Brunswick (New Jersey): Rutgers University Press. Venkatesh, Sudhir Alladi. 2000. American Project. The Rise and Fall of a Modern Ghetto, Cambridge (Massachusetts): Harvard University Press. Wyly, Elvin and DeFilippis, James. 2010. “Mapping Public Housing: The Case of New York City”, City & Community, vol. 9, no. 1, pp. 61–86. Zukin, Sharon. 2009. “Review of Public Housing that Worked: New York in the Twentieth Century, by Nicholas Dagen Bloom”, Contemporary Sociology, vol. 38, no. 6, pp. 584–586. It must be remembered that housing policy in general in the US is geared massively towards homeowners. Tax credits on mortgages represent $200 billion in fiscal aid, whereas social housing and Section 8 programmes combined receive $40.2 billion; as a result, households with annual incomes in excess of $250,000 receive over 10 times as much in housing subsidies as households with annual incomes of between $40,000 and $75,000 (Buckley and Schwartz 2011). For all these figures (percentages excepted), see Bloom 2012, p. 419.